Desi Smith /Gloucester Daily Times. 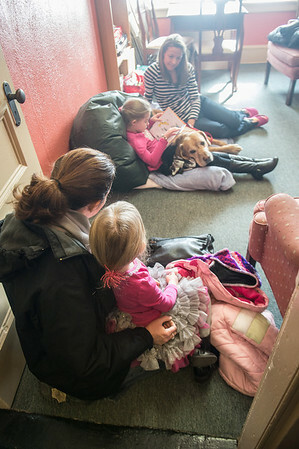 Sarah Adams (background) sits with her registered 7 year old therapy dog Rosco, a lab mix, as Fiona Flynn 7, of Essex reads to him. Mom Karen Flynn (forground) also brought her other daughter Keira 4, sitting on her lap to read to Rosco Saturday morning at the Essex Public Library. The idea is the kids' reading skills will improve because the dog doesn't judge, doesn't interrupt, and likes to listen.